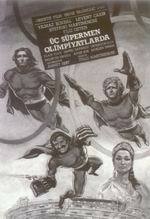 Incredibly low-budget entry in the 3 Fantastic Supermen series, this one features a predominantly Turkish cast. Our friends now battle an alien criminal organization trying to sabotage the Olympics. The aliens come complete with rubber masks. Stars Yilmaz Koksal, Levent Cakir, Stefano Martinenghi, Filiz Ozten and others. (In Turkish Language).